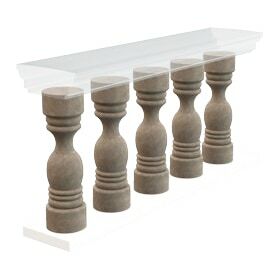 Thula Home Natural Stone Balustrades Balustrade Column / Crema Marfil / D: 6.2", H: 27.5"
Balustrade Column / Crema Marfil / D: 6.2", H: 27.5"
Make a statement in your house with a beautiful carved marble balustrades. This amazing views which will suit to your workplaces and the gardens of your detached houses can create very different living areas for customers, guests and you . Why don’t you and your loved ones benefits of these natural beauties that will add to the your places of stone mastery? Every piece of solid natural stone balustrade is carved from a single piece of natural big block. Packed in wooden crates with lots of support to make sure that you will recieve your order in great condition without any damage. All natural stone products published on ThulaHome.com are customizable. Select the colour from our natural stone products such as Travertine – Marble – Onyx – Limestone etc. then we need only type and size of the sink.